Found just 15-minutes from the beautiful beaches of southern Portugal, Amendoeira Resort is home to luxurious 4-star apartments & villas and two outstanding golf courses. From rolling hills to verdant valleys of almond, olive and carob trees, the area is the perfect landscape for spectacular golf courses, as shown by the quality of the Faldo and O’Connor courses at Amendoeira. Both offer equally exciting yet unique rounds and are playable by golfers of any handicap. Located near the charming town of Silves in the Central Algarve, the Amendoeira Golf Resort offers golfers visiting Portugal’s most popular region top class accommodation within a stone’s throw of some of the finest golf courses in the country. Set in an area of outstanding natural beauty, the luxury apartments and villas enjoy fabulous views to the magnificent Monchique Mountains. The hotel is less than 40 minutes from Faro Airport and features all the top quality facilities you would expect of a 4-star resort. Oceanico O'Connor - The undisputed highlight of the O’Connor Course is the designer’s take on Augusta National’s ‘Amen Corner’ – holes 7, 8 and 9 are skirted at various points by a great lake which snakes its way dangerously through three splendid holes. Oceanico Faldo - The best British player of the modern era has a distinct design philosophy, as he seeks to present a challenge to every player; however, he achieves this not simply through extreme length, but by demanding that the golfer exercises some strategy and thought. The Amendoeira Golf Resort boasts a superb range of luxury properties which have been inspired by a Moorish theme which reflects local influences. Expect graceful archways, cool tiled courtyards and lavish terraces that perfectly complement the levels of luxury found inside these top class accommodations. The accommodations at the resort range from spacious two bedroom apartments to grand four bedroom villas; perfect for couples and groups of golfers alike. All apartments are served by communal pools while those who opt for a villa will enjoy the peaceful benefits of their own private pool; the perfect place to cool off after a long day on the fairways. All accommodations are stylishly decorated and well equipped with modern amenities that are designed to maximize comfort and convenience throughout your stay. Elevated hillside settings ensure that no matter whether you opt for an apartment or a villa, you will be treated to magnificent views across the two golf courses and surrounding countryside. The Amendoeira Clubhouse is in the centre of the resort and has a large restaurant & bar and inviting lounge area with large TV. The restaurant opens at 7.00am and serves all-day breakfast, lunch and dinner. Golfers can purchase drinks and snacks from the golf buggy bar which goes around the golf courses regularly and post-golf drinks can be enjoyed on the spacious terrace which has stunning views over the golf courses or at the greenside spike bar. 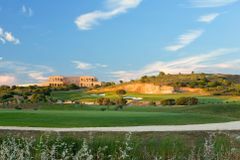 The Amendoeira Sports Club has a wide range of sporting facilities which are available free of charge for guests staying at the Amendoeira Golf Resort including five aside football pitches, tennis courts, a 1km jogging track and a fully equipped gym where users can make use of ample changing facilities and showers. We had two 2 bedroom apartments which were very spacious & comfortable with bathroom & shower room. although we didn't use the kitchen it had everything one would need. Take coffee/tea bags as sachets are supplied for first night only. so easy to get to & from clubhouse just pick up the phone dial reception & they will send minibus to pick you up within minutes! This was my third time at this resort and i totally enjoy it every time. The staff go out there way to ensure you holiday / break is one to remember. Thank you all contributed, i will be returning. Great resort! Excellent standard of accommodation. Welcoming and accommodating staff. Accommodation and staff were excellent. Resort itself a little isolated and food is poor. Very good resort for golf and staff very helpful and for a short trip no need for a car. The apartment was fabulous very clean looked brand new.Fabulous views over the course.Very spacious. the accommodation was excellent in fact we had no problems but think they would benefit from having another restaurant as the clubhouse is good but not always but sometimes something different would be nice also with it catering for groups mainly men who can get a bit boisterous . The staff are very helpful. Plenty to do on the resort. The apartments where great thou not comfortable to sleep. The resort itself lacks something. The bar and restaurant service is awful, this place could be so much better. We stayed in a 2 bed apartment. Accommodation was very good, clean, comfortable, a good size with all you needed for self catering ( we went B & B ). Buffet breakfast was excellent, great choice from fruit to fried/grilled food. Food in bar was ok however service could have been better. Just returned from a 4 night golfbreak in one of the resort’s 4 bedroom superior villas (sleeps 8). Wow, what an amazing villa, fully equipped with everything you need for a comfortable stay. Super infinity pool & large garden area with privacy provided by mature shrubs & a gated drive. The resort/clubhouse facilities are excellent & the staff are all very friendly & helpful - my only criticisms are that due to it’s remote location the resort would benefit from a larger grocery store/mini market & the clubhouse restaurant & bar needs more staff as wait times for drinks & food was pretty slow. Our party had a great time. Acommendation was very good.Food and drink excellent staff friendly and helpful. Looking to go again next year. Definitely recommend to anyone looking for a good value holiday. Villa accommodation was excellent, resort was superb, if only the bar understood customer service. After 6 hours on the golf course the table service needs to be better, repeatedly having to ask for more drinks is unacceptable. The villas were amazing, absolutely faultless. The golf staff, organisation of the golf, practise facilities and courses were fantastic. The only let down was the clubhouse bar and restaurant staff. The staff were rude, dis-interested and made everyone feel like we were a burden. The food in the clubhouse was poor as well. Great rooms although about half a mile from restaurant etc. So glad we had a car. Facilities were excellent and good food and drink, if service a little slow. Overall very good. This is an extended golf course and some of the hotel characteristics are missing. The breakfast was a bit hit and miss, the food could be cold at times. The apartment was very good but again lacks a bit of hotel add on's eg no soap or flannels in the bathrooms. Like much of Southern Europe there is a poor television provision for elderly Brits such as us. We do not drive abroad any more so the location required us to utilise the local taxis at extra cost. The two golf courses were of the highest order, even though they were extremely hard they were totally enjoyable. Tests the very best of your golf skills. My caddy tip - "Bring your A game to the course!!" Faldo course was tough, O'Connor easier, Victoria stunning. My Caddy Tip - "High ball flight very handy on Faldo course as greens are very well protected by sand." Found the Faldo course harder than the O'Connor and I was not prepared for the change in elevation- some real uphill/downhill holes. Accommodation was one of the best I have experienced. Food was great and the staff terrific. My Caddy Tip - "Practise your bunker play before you go!" Accommodation fantastic, staff helpful and the both O'Connor and Faldo courses are great. Although, they are very different from one another, they are both challenging yet playable for all levels. My Caddy Tip - "Approach to the 18th green on the Faldo course plays longer than the yardage." Both courses were in excellent condition, you need to be on your game to score well. Practice facilities are superb and the par 3 course was great fun. Buggies are a must, especially on the Faldo course. Accommodation is 5 star quality, with the only downside being that it is a 10 min walk to the clubhouse / restaurant. Although there is a shuttle service, it did not look too frequent so best to have a car which is also required if you want to eat away from the hotel, as nearest restaurants are 15 mins drive away. If there is any room for improvement, it would be a bit more choice to the restaurant menu, but this is a small criticism. Unlimited golf deal with buggies & being able to play another Oceanico course in Vilamoura is a great deal. My Caddy Tip - "Need to think before pulling the driver out on the tee, often position can be critical." Great little resort, Faldo course was much more challenging and fun but O'connor course is still of a good standard. Nice little par 3 course as well. My Caddy Tip - "Go for glory!" Golf was great but hotel can be very quiet at night. My Caddy Tip - "Course management essential." Fantastic trip and the second time I have been out to the Faldo complex. The courses are a great challenge and very different from each other. Excellent value for money both for the golf and the club house and accommodation. My Caddy Tip - "Play 12 on the Faldo like any other hole and don't let it intimidate you, as it is not very long." Accommodation 5 star. Courses top rated. Buggies and practice facilities included and the ability to get 36 holes in a day was great, although the usual Algarve slow players meant only 34 holes in one day. Stayed in a superb villa with each bedroom having en suite which helped. Eating at the Club was first class and not too pricey. All the staff were incredibly helpful. My Caddy Tip - "Play the front tees on the Faldo." Great venue, friendly welcoming staff at the clubhouse and around the course. I would recommend Faldo and O'Connor courses as both are challenging and exciting to play. A golfers must. Apartments are brand new, stylish, clean and luxurious. Clubhouse does great choice of meals at a very reasonable price. The breakfast provided on the B&B basis is buffet and a very good range of choice. Courses are great- O'Connor is good, but Faldo is one of the best courses I have ever played. Hard to pick a favourite hole, but 3rd stands out, and 17th requires little short of perfection to earn your par. My Caddy Tip - "Greens are true, and you can hit any club to them- they will hold." Food a bit limited and expensive at the clubhouse but lots of good restaurants nearby. Some really tough holes on both courses but generally quite playable for the higher handicapper. My Caddy Tip - "Avoid the bunkers." A good mix of different holes with good hotel facilities. My Caddy Tip - "Keep it on the short stuff and play below the hole on the greens." Faldo course is unsuitable for amateurs. The whole O'Connor course is a delight, but playing the 18th up to the raised green by the impressive clubhouse stays with you. My Caddy Tip - "Pick your way around the course carefully." Beautiful course and hotel, faultless. My Caddy Tip - "It's a long course." No favourite hole, every hole was a different challenge in its own right and a pleasure to play. I would recommend taking a few provisional balls because you are going to use them whatever your handicap. We stayed in stunning appartments and the shuttle service to and from club house was brilliant . Definitely going to return. My Caddy Tip - "Play percentage golf, use your shots wisely otherwise the course will beat you." Faldo course is tough with some difficult 2nd shots to uphill greens. 17 is a really good Par 4. O'Connor course is much more playable but still an excellent test of golf and needs to be played strategically. 14 is a tricky dogleg right. 2 bed 2 bath apartment was excellent. My Caddy Tip - "Take 1 more club with 2nd shots on the Faldo. Some holes on O'connor where you don't need a driver- particularly 14." Favourite hole was 1st on Faldo. Always use a buggy. Apartment was first class- good bed, well equipped kitchen and very comfy living area. My Caddy Tip - "Have a practice round before you challenge your mates." Absolutely stunning villa, 2 top quality courses, friendly professional staff. 20 mins from Albufeira. My Caddy Tip - "Get a buggy as both courses are long." Did not get to play both courses due to the conditions. Only played a mix of the two courses. Nothing to do in the evenings at the resort. My Caddy Tip - "Don't carry a bag." Courses and hotel were both fantastic. My Caddy Tip - "Get a course guide before you start." My Caddy Tip - "Take a buggy." Two brilliant courses and well worth a visit. We preferred the Faldo to the O'Connor (not that the O'Connor was bad!!) as it was more challenging, picturesque and had great changes in elevation. Really excellent. Hotel, golf and staff were all excellent, good food and reasonable bar prices too. We stayed in the apartments which were first class - Neff white goods, clean, maintained to a very high standard, pool just beyond the balcony, minibus to run you around the resort and reasonable transfers arranged by the hotel. Couldn't ask for more. I defy you not to love it.....Would recommend hiring a car if you want to get around locally. My Caddy Tip - "If you can play off the back tees - try it." 4th on the Faldo and 14th on the O'Connor were brilliant holes. Good resort, great facilities and friendly staff. My Caddy Tip - "Take lots of drinks and practice on the putting green before you play." Faldo was tough, played almost exclusively into the wind. O'Connor was fun and we particularly enjoyed the practice facilities, great trip. My Caddy Tip - "Course planner is invaluable. Off the tee, take great care placing your ball as you will need to have this in hand for your second."